It's either the coolest new zine in the already very cool PDX zine scene or one of the best collections of flash fiction you could find. Or both. 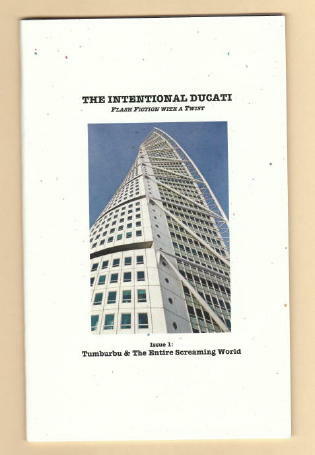 Either way, you should get your hands on The Intentional Ducati, Issue 1: Tumburbu and The Entire Screaming World. A Ducati in this context is more than a motorcycle. It’s a creation of a group of writers who follow what I like to call, when I’m alone here in my room, the Pinewood Path—or in other words, writers who have worked with and learned from two extremely smart, generous, and amazing writing teachers, Stevan Allred and Joanna Rose, who lead the Pinewood Table writing group. Here’s how Stevan, who edited and produced the Ducati zine, explains it. Every so often, Steven and Joanna invite writers who work with them to create Ducatis on purpose. They provide a list of phrases or elements, and those of us who are up to the challenge write short pieces incorporating some or all of the elements. The resulting pieces of flash fiction are called Intentional Ducatis. For me, writing these short pieces started as a playful exercise. Nothing serious—just a fun break from the burden of wrestling Wire to Wire onto the page. But looking back, I see that the Ducatis I wrote followed the first good advice I got as a writer, which was: Don’t work at writing—play with it the way a child would play with it. That approach brings out some amazing writing. It doesn’t mean the stories in Issue 1 aren’t serious—many of them are. But it helps explain why they are all so good. In the introduction to the zine, Stevan writes about the first time we gathered to share our Ducatis, several years ago. Last week, many of us who have been part of the Pinewood Table over the years joined Stevan and Joanna for a reading at the Blackbird Wine and Atomic Cheese Shop in Portland. Individually, the stories were terrific; hearing them back to back and noticing the subtle connections made the evening even more special. The event celebrated the launch of Issue 1, Tumburbu and The Entire Screaming World. Hopefully, there will be many more issues to come. You can read many of the Intentional Ducatis online here. But you’ll also want to hold the handsomely produced zine in your hands—if for no other reason than so you can wave it around ten years from now and let the world see the coolness that was Issue 1. To make that happen, email Stevan Allred here. 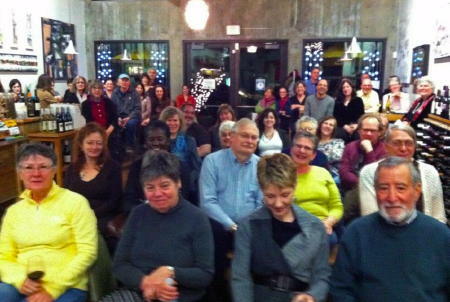 A packed house at Portland's Blackbird wine shop listens to Intentional Ducatis. Thanks to Julia Stoops—writer, artist, and designer of websites (including this one)—for the photo. "D is for Dangerous" and also for Ducati and try to keep your trousers on: The Arctic Monkeys.